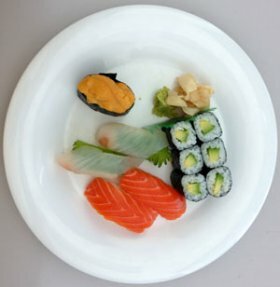 Rumor has it that this unappetizing picture of a sushi dish has been captured by the unreleased, evasive, and unknown iPhone 5. How can we tell you ask? Well the Internet is full of reports that the photos’ EXIF data states that the picture was taken with an iPhone 4 BUT has a cropped resolution size of 2235×2291. If you are a genius and are able to figure out exactly what megapixel size that is, you would come up with 5.12MP. Now all you iPhone 4 fanboys out there should know that the phone only has a 5MP sensor built into it. So what does this mean? According to the original unedited photo, it was just shy of 8MP. Need further proof? A closer look at the embedded GPS data shows the coordinates where the photo was taken – Apple HQ. Further evidence also shows that the f-stop on the image is higher than the iPhone 4 and the photo is marked with AppleMark. As always, Apple says nothing about the leaked image. It may not be long now until someone sheds some more light on the situation OR the photo could indeed be legit.